I love adventures, and any time I can couple an adventure with sports, it is the peak of the mountain for me. This past week I decided to take an adventure to the West Coast, a place I had never even been close to. From Sunday night, July 15 through Saturday night, July 21, I was in Oakland, CA devoting my time to rolling through the ‘hood and going to Oakland Athletics games. I went to five A’s games, to be exact. It didn’t take long for me to become enthralled with the atmosphere in the concrete monolith known as O.co Coliseum. Never drawing large crowds, the passion for A’s baseball in Oakland is surprisingly palpable, made all the more entertaining for me by the fact that three ex-Red Sox make up the heart of the batting order. Coco Crisp, Josh Reddick, and a resurgent Brandon Moss have become starting-nine staples on the east side of San Francisco Bay. I was not once bored with watching the 2012 Athletics. They’re exciting, likable, and can they ever come up with timely hits. To this point in the season, the Oakland A’s have 11 walk-off hits. Brandon Hicks and Brandon Moss both had walk-off hits (a home run and a single, respectively) while I was in O-Town. For a team that is 51-44 on July 24, tied with the Los Angeles Angles of Anaheim (STILL the most absurd name in baseball) for the second AL Wild Card spot, the A’s sport a league-worst .228 batting average. They are 27th in RBI with 344 and their batters have struck out 764 times, ninth most in baseball. So why, pray tell, are the A’s a winning baseball team tied for a playoff spot in late July with a total payroll of $54.5M? The Red Sox are four games out of a wild card spot, yet have committed $173.2M to a team with a losing record (48-49) on July 24. Along with timely hitting, the A’s have shown they can pitch, and pitch very well with young arms and an established bullpen. Pitching wins, and it shows in Oakland and allows the A’s lineup to come up with timely hits and ease the pressure off of struggling hitters. The A’s are fourth in baseball with a 3.37 ERA. They have only allowed 769 hits (good for 4th in baseball), have only allowed 321 earned runs (also tied for 4th), have only allowed 77 home runs (good for sole possession of 4th), and have a WHIP of 1.23 (good for 3rd in baseball). The A’s once again have a stockpile of young talent at the starting pitching position. Twenty-five-year-old Tommy Milone is 9-6 with a 3.34 ERA and a 120 ERA+ (an ERA+ above 100 is considered above average). Twenty-three-year-old Jarrod Parker is 7-4 with a 3.00 ERA and 133 ERA+. Brandon McCarthy and Travis Blackley are both having exceptional years and 25-year-old Ryan Cook is enjoying his first All-Star season in the bullpen. So what have the A’s done differently than Boston in order to win so much with a payroll roughly $120M LESS than the Red Sox’? First and foremost, even with limited funding, the A’s have not pursued overhyped free agents nor have they committed to trading away young talent under team control for “win-now” rental players. I think back on Theo Epstein’s tenure in Boston and yes, the man helped build a two-time World Championship team, but many of the moves he made were, for lack of a better word, atrocious. Free agent pickups like Julio Lugo and John Lackey were and have been miserable. One of the worst trades I can remember was trading outfielder David Murphy for Eric “Going, Going” Gagne in 2007. Since 2007, Murphy has hit .280 in six years with Texas along with a .343 OBP and 106 OPS+ (again, above 100 is above average). He has 66 home runs and 48 stolen bases. After the trade, Murphy batted .343 for Texas for the rest of 2007. Eric Gagne, however, went 2-2 for Boston with a 6.75 ERA in 20 games and was, mercifully, not a postseason-ender that year. 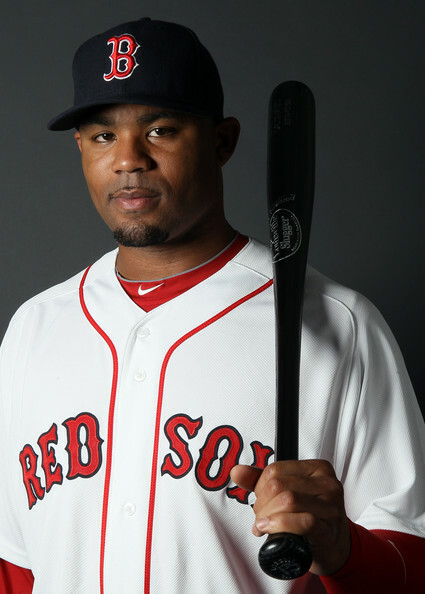 Carl Crawford is yet to be determined, but with how this season has gone and with rumors of Crawford being shopped for Hanley Ramirez, we can chalk that up to another poor Epstein move. This offseason the A’s swapped outfielder Ryan Sweeney and closer Andrew Bailey to the Red Sox for outfielder Josh Reddick, a player I was screaming to keep knowing Crawford might not be 100% and also having that right-filed slot open. To this point in the season Andrew Bailey hasn’t pitched in the big leagues due to a thumb injury and Ryan Sweeney has batted .267 with no home runs and 14 RBI. Josh Reddick stares down a Roy Oswalt offering on Tuesday, July 17. Let us not forget how the 2004 Red Sox came together as a team and gelled. Their clubhouse chemistry was amazing. This year, it is looking more like 25 players and 25 cabs. In Oakland, the clubhouse chemistry could not be better. Walk off’s are met with Reddick pies to the face and Gatorade baths. The team fights for every run they can scrap. The A’s are fun. The Red Sox are likely done. Happy “hump day” and welcome into another outstanding edition of the Daily Noontime! Let’s kickstart the day with some news and headlines! * Despite no Ray Allen and Kevin Garnett, Boston still managed to defeat the Miami Heat on Tuesday, 78-66. 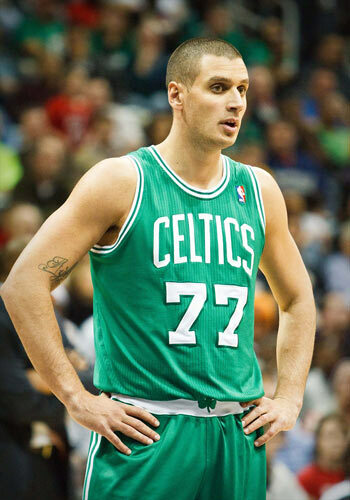 Sasha Pavlovic paced the Celtics with 16 points, while Marquis Daniels added 13 points off the bench. * Boston will conclude its 66-game slate on Thursday when they welcome the Milwaukee Bucks to the TD Garden. Boston is currently 38-27 in the Eastern Conference, and will most likely begin their first round series against Atlanta on the road, as the Hawks have a better record than the Celtics. * Josh Beckett earned his second win of the 2012 season, as Boston defeated Minnesota, 11-2. Mike Aviles, who hit leadoff, finished the contest with three runs, four hits, two RBIs and one home run, while David Ortiz cranked his third long ball of the season. * Boston will conclude their three-game series with Minnesota on Wednesday at 8:10pm — Clay Buchholz will oppose Liam Hendriks. * According to reports – Carl Crawford is seeking a second set of eyes to look at his left elbow. The Red Sox outfielder had returned to Florida to continue his rehab assignment on Tuesday, and according to the manager, there really isn’t anything else to report. * Boston and Washington will skate for the final time on Wednesday in Game No. 7 of the Eastern Conference quarterfinals. The winner will advance to the semi-finals. * Sources confirmed that Patrice Bergeron sat out of Tuesday’s practice, but is expected to be in the line-up for Boston. Also, Alex Ovechkin has told reporters that he’s unhappy about the amount of ice time he’s experienced in this particular series. It’s Friday, and while we don’t need to break out into song and dance, let’s instead dish out some headlines and news from the Hub! * Despite rallying to tie the game, Washington’s Brooks Laich netted the game winning shootout goal, which helped the Capitals defeat the Boston Bruins on Thursday, 3-2. Tim Thomas recorded 21 saves between the pipes, and held Washington scoreless for the first two frames. Had Boston won, they would have clinched a playoff spot, but luckily, the Black and Gold will return to the ice on Saturday when they travel to Long Island to face the New York Islanders. * The Boston Celtics will return to the hardwood on Friday when they travel to Minnesota to face the Timberwolves. Tip-off is scheduled for 8:00pm. * Celtics President Danny Ainge made his weekly appearance on Boston sports radio WEEI on Thursday, and told The Big Show that he’s not planning on forcing Mickael Pietrus to get back on the court. He’s expected to return to the lineup soon, but according to reports, the Celtics should have more information on his concussion he sustained last week in Philadelphia. It’s been a while since a dark, stormy cloud drifted over the city of Boston. For the past few weeks, Bostonians and New Englanders have appeared aggravated and disgusted with their four major professional sports teams because they’ve either struggled or disengaged. Yet, let’s take a step back and realize that these particular days will pass because Boston is still technically the “City of Champions,” especially since all four major sports teams have won at least one championship in the past 11-years, right? So, without further ado, let’s take a stroll downtown and check in with the Bruins, Celtics and Red Sox, who’re currently stealing the spotlight from the New England Patriots, who ended their season a few weeks ago in Indianapolis, Indiana. Thoughts on the Sox: It’s way too early to deem the upcoming Boston Red Sox season a failure, especially since it’s only been two days of pitchers and catchers. Manager Bobby Valentine has done a rather decent job with the club over the past few days, and appears eager to help everyone improve, especially Daisuke Matsuzaka, who according to the Boston Globe, played catch with his skipper on Monday. However, the highly touted pitcher isn’t expected to return the Fenway Park bump until midseason, as he’s currently recovering from Tommy John surgery. Carl Crawford seems focused and determined to improve his performance from last season, despite ending the year with 129 hits, 29 doubles, seven triples, 56 RBIs and 18 stolen bases. Also, he struck out 104 times at the plate, too. Yet, similar to Matsuzaka, Valentine doesn’t want to push his leftfielder back into the lineup because he’s currently recovering from surgery on his left wrist. Finally, a majority of the Sox position players have already arrived in Fort Myers, which is a hopeful sign that they’ve moved on from their chicken and beer rituals from last season. Boston is expected to conduct their first full team workouts on Thursday, and I’m sure after it concludes, we’ll have plenty to discuss around the water cooler in regards to David Ortiz to Cody Ross to Jason Varitek. The aging Boston Celtics: Literally two weeks ago, I was sitting in the TD Garden watching the Green and White face a Memphis Grizzlies squad that probably should have won this particular clash, especially because they’re younger, quicker, stronger and faster. Although, Kevin Garnett denied the Grizzlies of a much needed win by turning in 22 points and nine rebounds, which helped Boston escape with a 98-80 victory. Although, ever since that particular day, Boston has endued a 2-6 slump, which includes two losses to a struggling Detroit Pistons team that’ll most likely miss the Eastern Conference playoffs. The Celtics are a complete mess, and need something or someone to spark their offense and defense, but what exactly should they do? 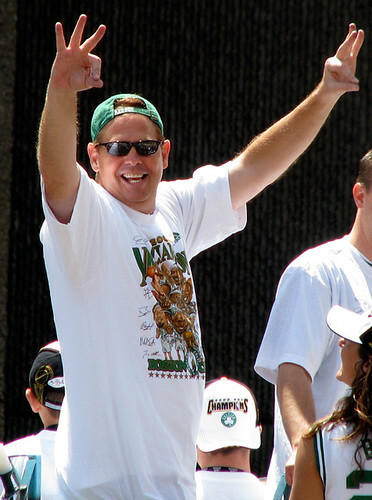 Should team president Danny Ainge create a blockbuster move or keep the roster intact? What would Red Auerbach do? OK, that maybe the wrong thing to ask, but really, what would the former coach do in this particular situation? It’s hard to determine what will happen over the next few weeks, but it’s pretty certain that a change is needed, especially if Boston plans to contend for some hardware in June. The Bruins need to score goals: Similar to the Celtics, the Bruins are struggling. They’ve lost two of their last three contests, and registered a goose egg (zero) on the scoreboard for the sixth time this season this past Sunday when the Minnesota Wild blanked them, 2-0 on national television. However, Boston can salvage their current six-game road trip with wins in St. Louis, Buffalo and Ottawa, which might turn some frowns upside down. Various reports on Tuesday and Wednesday confirmed that Nathan Horton is expected to remain sidelined, while Rich Peverley continues to be hampered by a knee injury. Also, Shawn Thornton has been battling an illness, which could prevent him from playing against the Blues on Wednesday. Although, despite the various injuries, as well as bumps and bruises I think, Patrice Bergeron summed it up perfectly when he told the media that his teammates aren’t expecting the front office to locate a “savior” to assist the Bruins, who’re currently on par to snag the second seed in the Eastern Conference. I don’t think a drastic change is necessary for this particular squad. What Boston needs to do is focus on scoring the first goal, and capitalizing on it. They also need Tim Thomas to keep his mind on hockey, not politics or social media. The Bruins will be fine, but I’m not ruling out a potential trade that could help Boston in May and June. Happy “Hump Day,” and welcome into another grand edition of the Daily Noontime! Here are some headlines and news to kick-start your day, enjoy. * On Tuesday, Carl Crawford underwent arthroscopic surgery on his left wrist due to soreness he sustained during his offseason training regimen in Arizona. GM Ben Cherington believes the Boston Red Sox leftfielder should be able to play this season. However, it’s possible that the Sox will have to explore other options, while Crawford recovers. Will he return to the diamond in April? We’ll have to wait and see! * The Boston Bruins dropped to 1-2 on their current four-game road trip, as the Tampa Bay Lightning handed the Black and Gold a 5-3 loss on Tuesday. Nathan Horton netted two goals, Daniel Paille scored a shorthanded goal, and Tim Thomas saved 26 shots between the pipes. The Bruins will wrap up their road trip on Thursday when they travel to New Jersey to face the Devils. * Indianapolis Colts head coach Jim Caldwell was recently fired after his team finished the season, 2-14, and according to a report on Wednesday morning, it’s possible that Peyton Manning may not return to quarterback the team next year. * According to an interesting Yahoo! Sports blog report, it’s possible that the Boston Celtics might actually deal Paul Pierce, as well as Ray Allen or Kevin Garnett to clear cap room. Both Allen and Garnett are expected to be free agents after the season concludes, while Pierce has two-years remaining on his current contract. The Celtics are currently ranked third in their division, as well as one and a half games out of eighth place in the Eastern Conference.